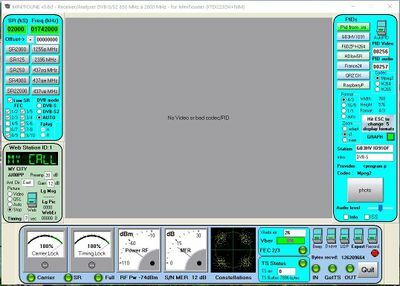 The MiniTiouner USB receiver uses free to download DVB-S receive and analysis software called "Minitioune" written by F6DZP. The Software, which will run on a PC with Windows 7, 8 or 10 operating system, is hosted on the VivaDATV forum. You need to register and be given a log-in to download the software. Please note MiniTuioune is not open source and will not run under Linux or MAC o/s. You will need Version v0.6 or newer if you have built a MiniTiouner Version 2 board with a Serit tuner (or a Serit tuner on a version 1 board with adapter card). Full installation procedure is at the bottom of this page. The MiniTiouner hardware is connected to the PC via USB2 mini cable. Connect up your MiniTiouner to the PC USB port and apply volts - then run the test programs found in the directory where you extracted MiniTiouner to. All test should pass - if it fails the USRC filter test try running the install_usrc_ax_winXP.exe file in the directory and run the test again. The Minitioune software is very comprehensive DVB-S receive and diagnostic software but can be a little overwhelming when you first run it! A satellite signal from your domestic satellite dish. A local DATV signal from Portsdown (Ugly mode is fine) or any other DATV transmitter - a short piece of wire in the tuner input socket will probably pick up enough signal but be careful - there maybe DC volts on the socket. An off air DATV signal from your local repeater or "buddy down the road" (did I really write that!) - make sure you have a filter and line amplifier between your pre-amp and tuner input but be careful - there maybe DC volts on the input socket and most filters are DC short circuit. Start the program and you should see the please wait message. If you get the USB error message then you hardware is not connected. If you see the more complex expert mode below - simply click the top of the "expert" switch in the bottom right hand corner of the screen. Symbol rate (SR) - type the symbol rate directly in to the top left green box. (Note this should be the SR in kilosymbols in the following form - 00250 for 250kS, 02000 for 2Ms,or 27000 for 27Ms. FEC - tick the box to match the FEC of the transmission you are wanting to rx. DVB mode - tick the correct mode box. Currently all DATV signals are currently DVB-S and most domestic satellite signals are DVB-S2. For ATV operation make sure the DVB-S box is ticked and not auto. Low SR - if you are trying to receive a signal greater than 1Msymbol or 1000ksymbol untick the low SR box. Frequency - type directly in to the top right green box. (Note this should be the L band frequency in the following form - 01255000 for 1255MHz. if it is not the correct format the box will be greyed out). If you are using a Serit tuner, which covers 144 - 2550 MHz without any upconverters, make sure you have NO offset in the white box under the frequency box. If there is a a number present simply enter "00000000" to overwrite it. If you are using a Sharp tuner with an upconverter you will need to enter the L band frequency in the green box or the receive frequency in the green box plus LO offset in the white box. If using a Serit tuner, select the A or B f type connector using the A or B button. (note the A socket is the one furthest away from the PCB on the tuner can). The 3 "lights" at the bottom left of the screen should now turn green, the meters should indicate signal level and MER, you should see dots in the 4 quadrants of the constellation window and the Viterbi error bar graph should go green. If this has happened but there is no video displayed in the center window, navigate to the top right of the screen and click the "Auto PID" button - the video should now appear! Place a jumper on J3, which is near the 12v power socket. Check that there is now 12v on the upper NIM F socket. Connect the upper NIM socket to a Sky dish. In the frequency setting area in the top left of the screen, put 09750000 into the OFFSET box. Click the PLUS / MINUS indicator next to it so that it shows MINUS. Put 10758000 into the FREQ box. Put 22000 into the SR box. Further down from the FREQ box, below the frequency buttons, check that DVB-S and Fplug-A are selected and that there is a tick in the checkbox next to 5/6 FEC. You should now see the ITV program in the video window. There are several channels on each Sky transponder and these should appear on the buttons at the top right of the screen, below PIDs. A 12v supply will select vertical transponders. Use 12v rather than 13.8v, to stay below the switching threshold for horizontal transponders. Other transponder frequencies can be found at https://www.lyngsat.com/Astra-2E-2F-2G.html The symbol rate (SR) and DVB-S / DVB-S2 setting may need to be changed for other transponders. Note the MiniTiouner hardware does not generate 22KHz and will not switch in the High LO in an LNB. However, as the tuning range of the MiniTiouner with a Serit tuner goes up to 2450MHz it is possible to receive the higher channels by using the 9750 offset described above. Simply take 9750 off the channel frequency and enter the result in to the frequency box. To receive the horizontal channels either supply 18v to the LNB supply via fuse 2 (be very careful not to short to 12v!) or simply turn the LNB on the dish through 90 degrees. Set of soft controls located at the bottom right of the screen. The "Record" button records the received transport stream as a .ts file in to the folder where minitioune.exe was installed. .ts files can be replayed with WMP or VLC. The "Bleep" button enables an audio tone which varies in pitch depending upon the strength of the signal being received. Useful for peaking up aerials or adjusting filters and pre-amps. The "UDP" button enables the received transport stream to be played out in real time over UDP, enabling it to be played on a remote PC using VLC. The "Expert" button reveals a whole host of additional controls described below. The "Dsave" button records a number of parameters about the received signal, such as strength MER and TS Lock as a .txt file. 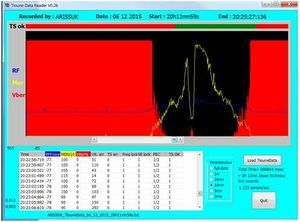 These can replayed in the TiouneDataReader.exe program to give a graphical display of the received signal. This is useful for later analysis when receiving signals such as the ISS HAMTV transmissions. To edit the file, first save a copy of the file on to your desktop - this is so you can always go back when you mess up (and you almost certainly will)! Then double click the file and it should open in wordpad. One really useful feature of MiniTioune is the ability for remote stations to monitor how well you are receiving their signal. To enable this you need an account on VivaDATV where you downloaded the software from. Then you need to edit the miniTioune.ini file as described above. Go to the [WebMonitoring] section and put your call sign where it says OM_ID=MY CALL, enter your vivadatv password forum and your QRA. Save the file and restart MiniTiouner. The web monitoring panel will now show your call sign and locator - tick the "auto" box and turn the monitor switch on. Now go to http://www.vivadatv.org/tutioune.php?what=map and zoom in on your location - you will see that stations who have their web monitor turned on are shown in green. Stations who are actively receiving a signal are shown as bouncing green pins - click on the pin and you can details of the signal being received, including MER, RF Level, FEC, bit rate and a thumbnail updated every second. You may find that some stations seem to have jerky video or poor intermittent sound and can be decoded more reliably with the open source VLC player. This is because MiniTioune uses the standard Windows demultiplexer to decode the audio and video and this is very critical on timing of the incoming signal. If the incoming signal is not strictly DVB compliant and has PCR or PTS errors (the PCR timing must be less than 500 nano seconds) the Window demultiplexer will not decode it properly and it has been found that VLC is more tolerant to errors. Now launch VLC, go to Media > open network stream and enter udp://127.0.0.0:1234 in the network URL box and press play. To use VLC and a seperate device (PC, Media player, Raspbery PI etc) put the IP address of the player device in the MiniTiouner .ini file and then put udp://@:1234 in the VLC network address on the remote device. There is a readme file contained in the download which you should read. Download and install the D2XX drivers 2.12.24 found at http://ftdichip.com/Drivers/D2XX.htm. There's a link in the right column for a setup executable. Look in the Minitiouner folder that you've just copied to C:\ for the small program "Install_usrc_ax_winXP" and run this to install the link with the decoder. Plug in your MiniTiouner hardware and let the USB drivers install. Run the MiniTiouner test program - "CheckMiniTiouneDriverAndFilters_V0_3a.exe" - it should pass on all sections. This page was last modified on 25 March 2019, at 18:18.